When you’re a new parent, everything is significant. And nothing is more nerve-racking for both child and parent than a high fever and its companion, the hair-trigger temper and its attendant crying fit (again, for both child and parent). So in the Daley history books, the second week of September will from here on be known as the time of Cold/Flu Number Two. So what have I learned? First, I’ve got one tough kid. I’m really proud of him. And, second, I never knew how many folk remedies my husband can whip up. While I was surfing the web about antibiotics and second-opinions, my lovely husband was busy in the kitchen, formulating one of his many lemon-and-honey based concoctions. And although Fionn didn’t really get into the whole chicken broth – tea – Vapo-Rub under the warm towel thing, it sure comforted us. For what it’s worth, Daddy’s remedies made me feel a heck of a lot better… (Have I mentioned lately how much I love Lancashire? Guess the wet North has something to say about keeping kids warm and dry). 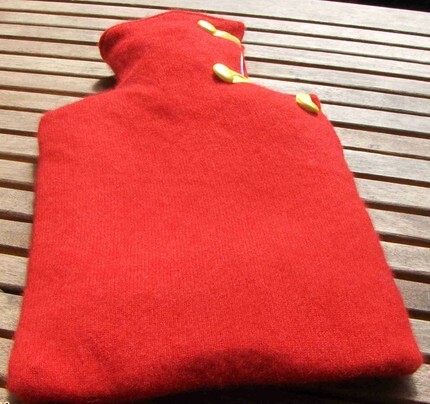 And this experience has also made me curious about getting a custom cover for our tough red rubber hot water bottle so Fionn could use it too. 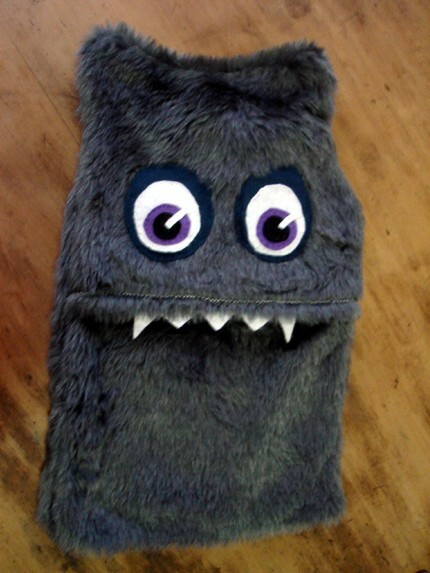 I’m leaning towards the Hot Water Bottle Monster by Jaffajaf, available on Etsy (where else?) for $25. Based in Brisbane (where else… Australia really has a hold on cool kids stuff right now), Jaffajaf is the nanna-granddaughter team of Yvonne and Debbie. 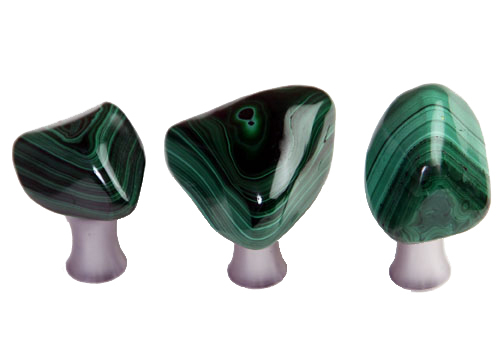 They’ve got a fantastic touch and I’d highly recommend checking out their online shop. Their felted dinosaurs are especially wonderful. 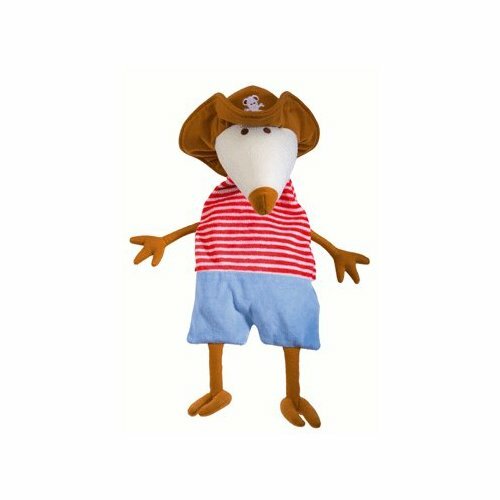 But to be honest, I think I’m more of a Pirate Mouse kind of gal. I’m not sure he’s made near the Swiss Alps, but he is German, if that helps anyone… Available on Amazon.com for $25.95, I think he could easily become a bedtime favorite (with or without the hot water). If you’re into something more traditional, I’d recommend one of these ‘knitted sweaters’ made expressly for hot water bottles. The Internet is full of instructions on how to do it yourself (which seems to be a lot of fun to make). But if you’re like me, and would rather reward those who have perfected the craft, you may want to head over to the shop on Etsy called A Crooked Sixpence. 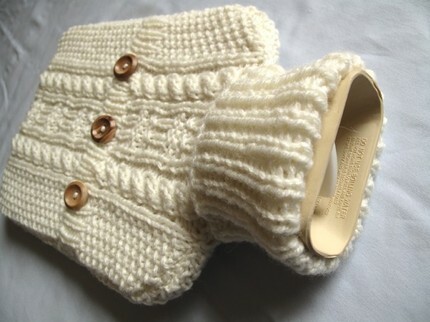 Above, this is their Aran jumper in the White Chocolate color, for $36. But my absolute favorite? (Yes, I know I started this post talking about my son). 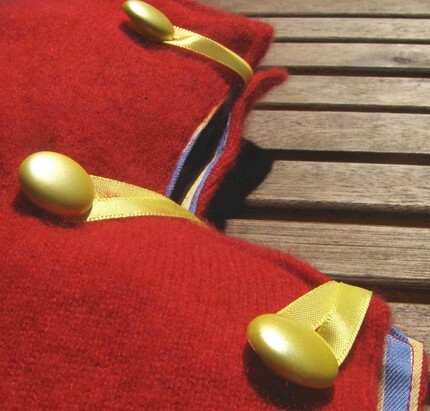 An ‘upcycled’ cashmere sweater. Taking the logic one step further, why knit when you’ve got perfectly wonderful cashmere right at your fingertips? The Honeycreweller shop on Etsy offers this one in red for $32; there are other colors available as well. 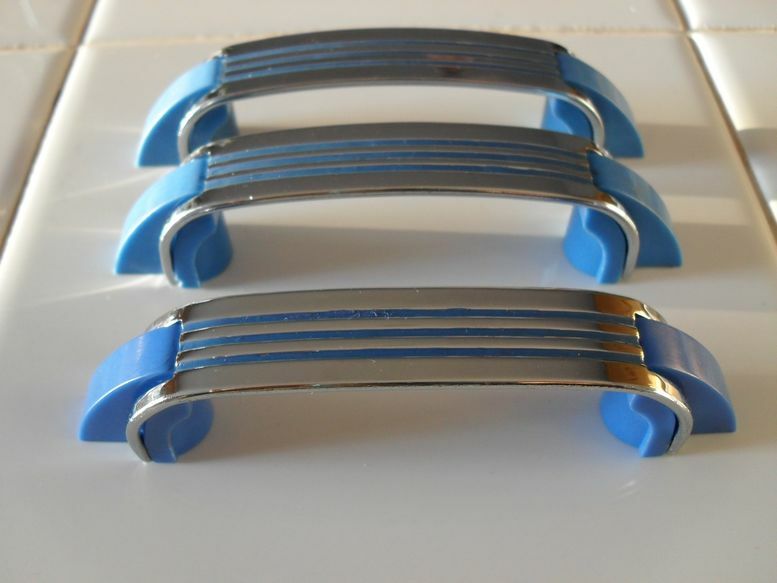 I especially love the contrasting satin ribbon and button closure detail and the blue cotton lining. Because I know when I’m feeling sicky, beautiful fabrics and coordinating materials really cheer me up. 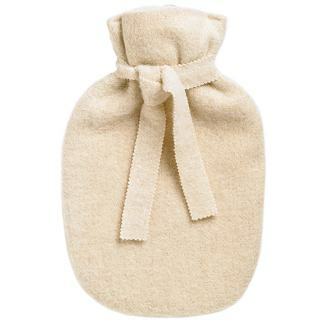 For Fionn, I think the hot water bottle monster would be a surer bet. There’s an amazing little spot on Atlantic Avenue in the Boerum Hill section of Brooklyn called Vintage Signage. I hesitate to call it a ‘store’ because it doesn’t seem like they actually sell anything there. Packed to the rafters with everything from vintage Bibendum figurines to just-plain-old Keith Richards posters, the store literally spills out onto the sidewalk in front. However, nothing in this closet-like space seems to feature an actual price tag. In following that old adage about ‘if you have to ask..,’ I’ve never ventured beyond browsing. Walking by the shop the other day, I just had to stop and take a few pictures of this odd piece of hardware. It’s unlike anything I’ve ever seen. And if it’s still there when I walk by again later this week, I’m going to find out how much it costs. 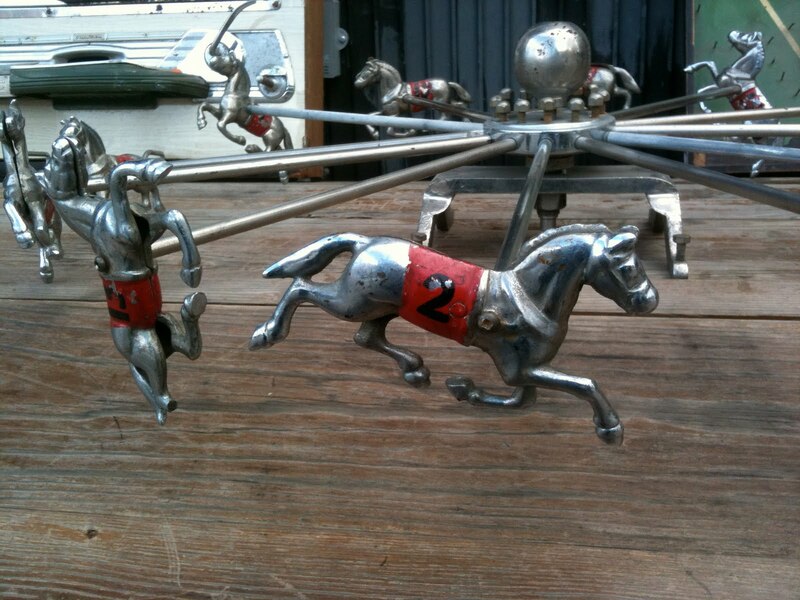 Twelve race horses with numbered red jackets are attached to spokes. 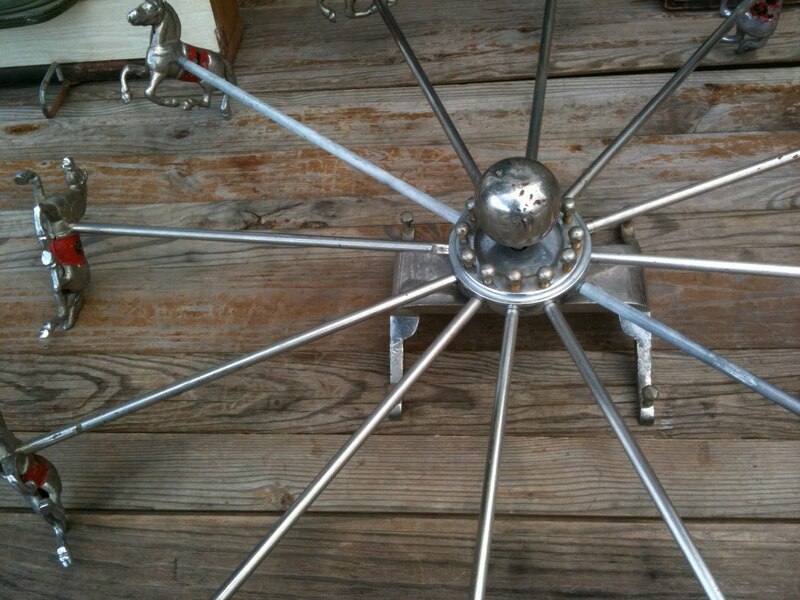 The whole thing is metal, and it spins around a mounted base. I have no idea what it is. My dad suggested that it was probably attached to a game in the old penny arcades. 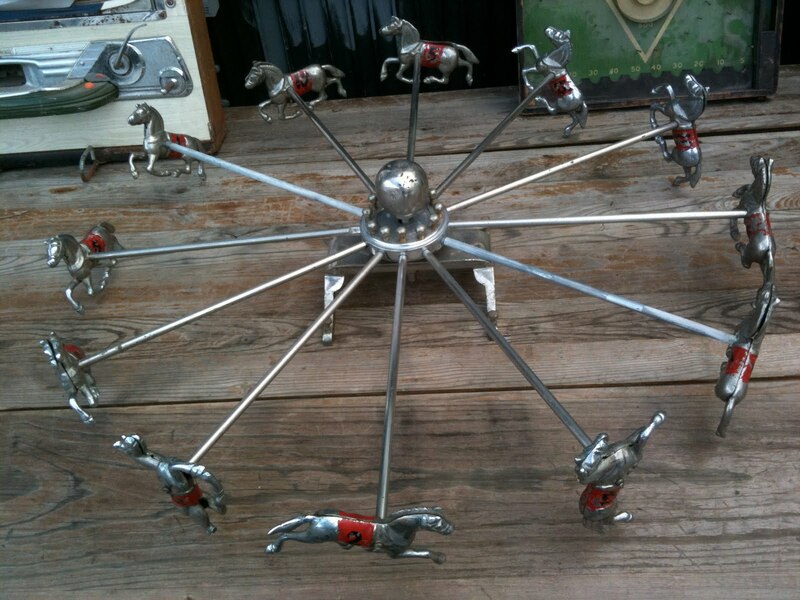 If it’s not too heavy, I think it’d be perfect to mount sideways on a wall as both decorative toy and folk art. I could see an entire room designed around it – reds and whites, flags and jockeys’ uniform patterns. You’ve probably heard of Little Sapling Toys, makers of the coolest handmade stackers, teethers and rattles. 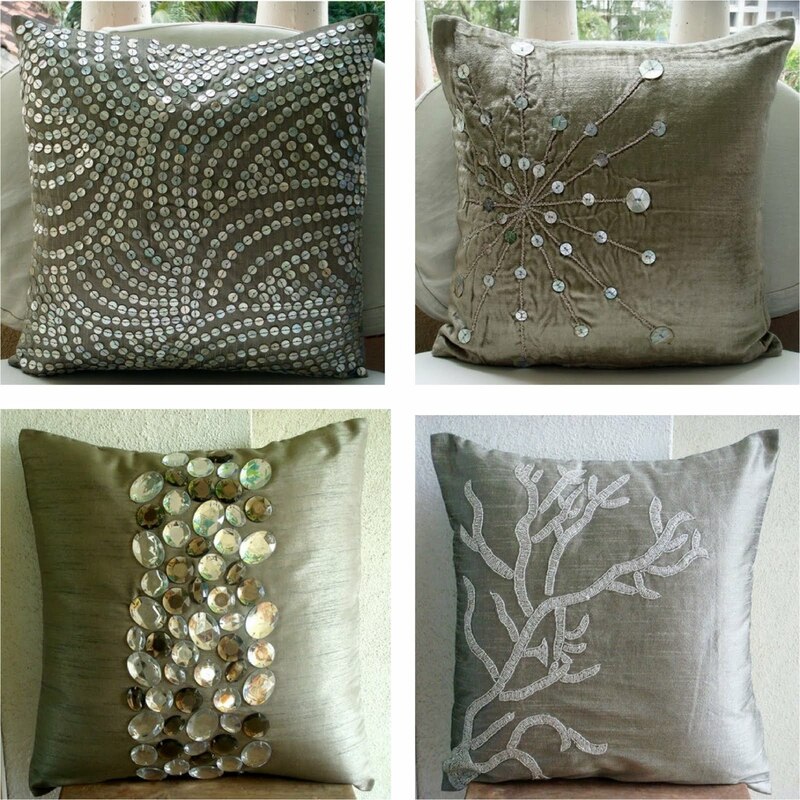 If you haven’t yet, check out their shop on Etsy. 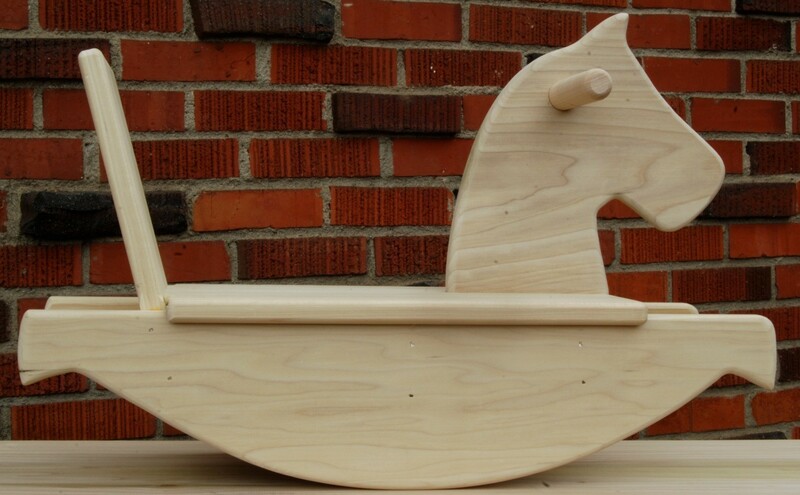 In keeping with the race horse theme, I discovered their beautiful Mod Toddler Rocking Horse. It’s a beautiful piece of handmade woodwork. 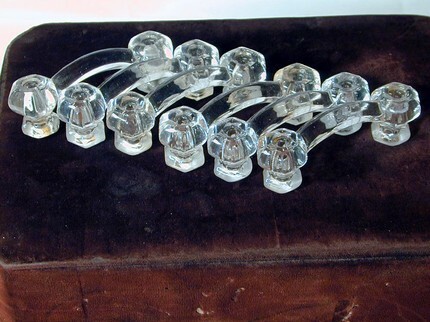 At $65 you’ll have a unique heirloom to treasure, long after your kids have outgrown it. Plus, with every toy sold, Little Sapling plants a tree through Trees for the Future. 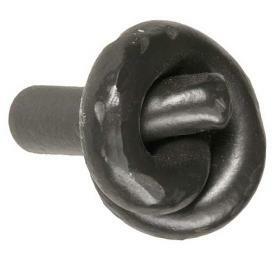 Stumbled upon any other equestrian finds? Let me know in the comments section. 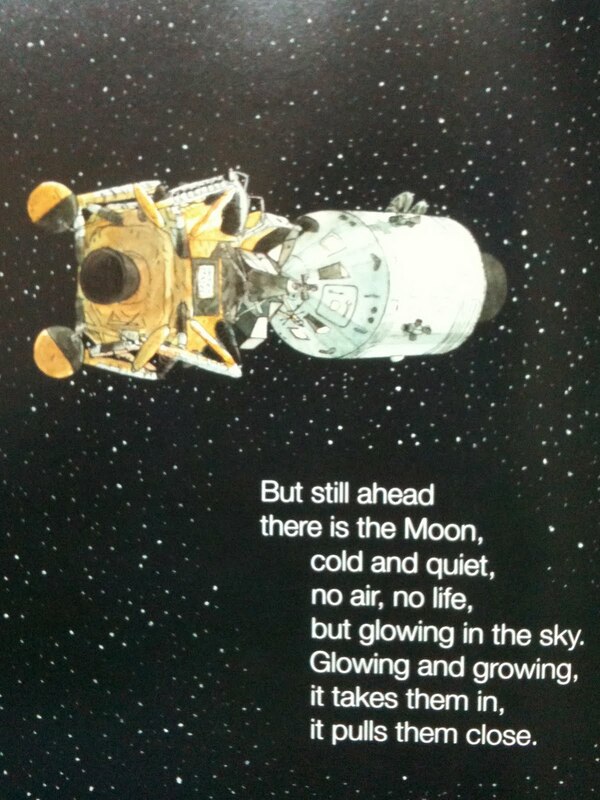 Do kids still dream of being astronauts? I really hope so. 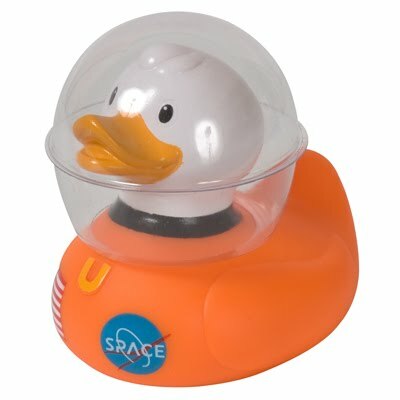 Say what you will about the American space program, I think everyone would agree that learning about space is one of the best parts of being a kid. It feels like Space Week here at the Daley household. (Actually, that’s not totally accurate. If it were up to my husband, it’d be Space Week EVERY week. For All Mankind is already in constant DVD rotation, and Failure is Not an Option by Gene Krantz is currently on the nightstand. If you’re a space fan, please check out both. You won’t be sorry). On a trip to Florida, our old friends stopped by the Kennedy Space Center and attended a lunch with astronaut Al Worden (who flew to the moon on Apollo 15). The space shuttle Endeavour is headed to the International Space Station this Sunday morning. And I discovered this book at Bookcourt, our local, and most amazing, bookstore. 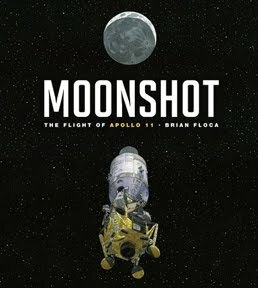 Elegantly written and illustrated, it celebrates the voyage of Apollo 11 in a heartbreakingly beautiful way, from preparation, through the flight itself and the astronauts’ return to Earth. So for those future astronauts, here’s a few suggestions for bringing that sense of wonder back home. 1. 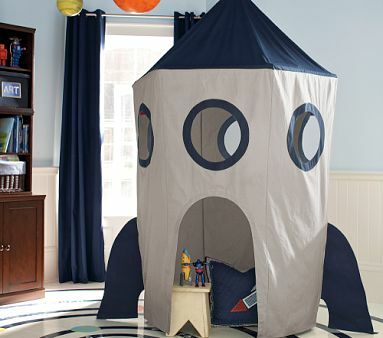 A rocketship tent. At almost 8 feet high and nearly 4 feet across, there’s lots of room in here to plan the next mission. (Incidentally, one of my earliest memories is of playing in a ‘rocket’ in nursery school. . . although the memory revolves around me hitting my head and going to see the nurse. Not cut out to be an astronaut, I suppose.) I always wanted a play tent as a child, and I haven’t seen one finer than this one. 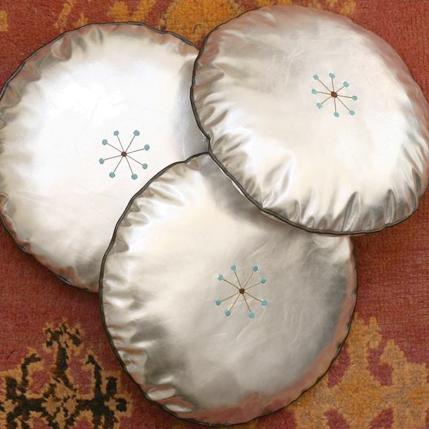 Pottery Barn also carries other fantastic space-related items, such as a constellation rug and a set of hanging planets. 2. Custom rockets. 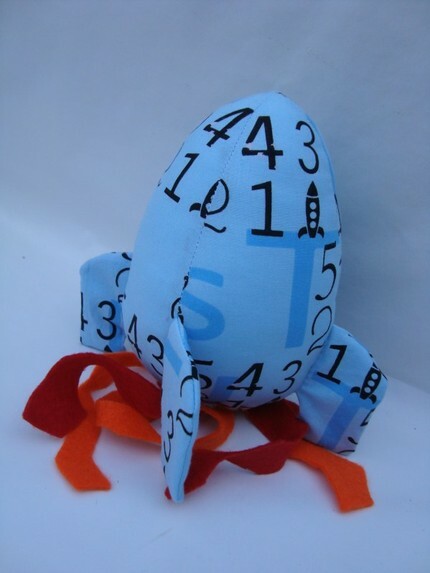 I found these clever little stuffed rocketships on Etsy – they come in a variety of fabrics and sizes, and are made to order. 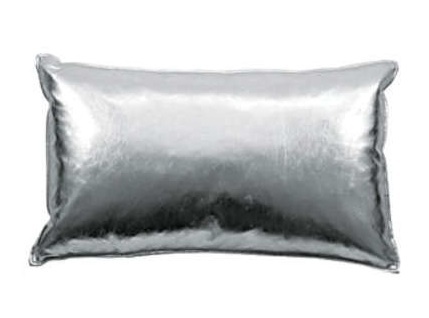 I think they’d stand out as great baby shower or newborn gifts instead of the traditional stuffed animal bear or dog. 3. Your own freakin’ star. 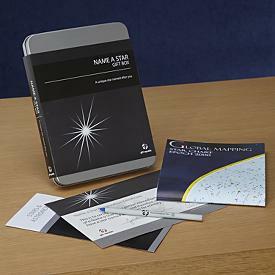 As the listing announces, “the majority of stars are unnamed and distinguished only by a catalog number.” For $40, you’re given a star and a guide on how to find it in the night sky. Of course, it’s a bit of a gimmick. But can you imagine being a kid, and getting a certificate saying that Star “Aidan” is now ‘officially’ recognized? It’s got to be exponentially better than a fake birth certificate that came with my Cabbage Patch Kid, and I thought that was pretty amazing at the time. 4. The Mighty Boosh on DVD. Noel Fielding and Julian Barratt know how cool the moon can be.